Chester Carlson? Whenever I think an idea or project will not make it, I think of Chester Carlson. Most people do not know who this person is, but he came up with the second greatest invention of the last 500 years (after the printing press); xerography; and he was not even a engineer. There should be a movie made of this guy: grew up dirt poor, lost his parents at a young age; worked his way through college, earning a degree in physics, and law school; invented xerography. 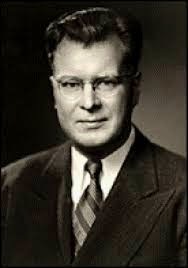 Anyway, the reason I mention Chester Carlson is that even though he thought up xerography and demonstrated it at the Astoria hotel in 1938, the first copy machine (made by the Haloid Corporation who changed it name to Xerox) was not made until 1958! Twenty years later. During that time, there were many set backs, but Mr. Carlson believed that being able to print without water would be a “disruptive” technology, so he never gave up. There were many nay-sayers. Incredibly, Carlson was quite alone in his work, and in his belief that xerography was of practical value to anyone. Following this first demonstration of xerography, Mr. Carlson searched for years in a fruitless quest for a company that would develop his invention into a useful product, and was turned down by over twenty companies, including IBM, GE, and Honeywell, during that time. Incredibly, no one could believe that a tiny glass plate and rough image held the key to a tremendous new industry. During these painfully long years, Mr. Carlson became discouraged and several times decided to drop the idea completely. Still, he could not abandon this disruptive technology and he stayed thoroughly convinced that the invention was too promising to be left on the scrap heap of history. Finally, in 1944, Battelle Memorial Institute, a non-profit research organization signed a royalty-sharing contract with Carlson. In 1947, Battelle teamed with a small photo-paper company called Haloid (later to be known as Xerox) to develop a xerographic machine. It was not until 1959, twenty-one years after Carlson invented xerography, that the first convenient office copier using xerography was unveiled. The 914 copier could make copies quickly at the touch of a button on plain paper. It was a phenomenal success. Today, xerography is a foundation stone of a gigantic worldwide copying industry, including Xerox and other corporations which make and market copiers and duplicators producing billions and billions of copies a year. So, bottom line: It may take a long time, but if you KNOW something is worth pursuing, NEVER give up! Chester Carlson never did. As a footnote, Mr. Carlson made 1/1000th a cent per copy as a royalty, and when he died, he was estimated to be worth $266 million. Ya that's great, but you need to remember that for every Chester Carlson there are thousands of people who labor their whole lives on a project, idea, or invention and never get anywhere. A great idea, hard work, and intelligence are the antes into the game. What no one ever acknowledges is that timing i.e., luck have a great deal to do with achieving success. Anon... I could not agree more..but why most people fail, is that they never reach out to others who might help them...and MAKE THEIR OWN LUCK! BTW, you should read the book, "The Luck Factor" by Wiseman.. you will find it fascinating.